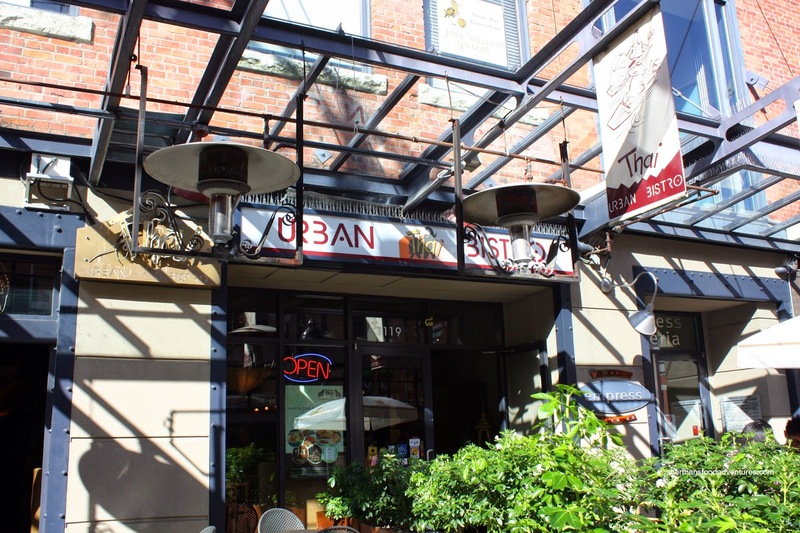 When I used to live in Yaletown, I would frequent some of the local restaurants (oh how I miss that now I'm in the 'burbs). One time (no, not at bandcamp...), I met up with Choobee at Urban Thai. To be honest, my memory of the place is pretty indifferent. Also, I was too busy listening to Choobee's endless yammering to create a lasting memory. She can make Joan Rivers look reserved... I digress. Also, I did do a Thai cooking lesson there a few years ago, but that didn't count as a visit per se. Therefore, when I was invited to a tasting of their new menu from their new chef, I thought why not? So with Miss Y as my trusty eating companion, we headed off to see what interesting things awaited us. 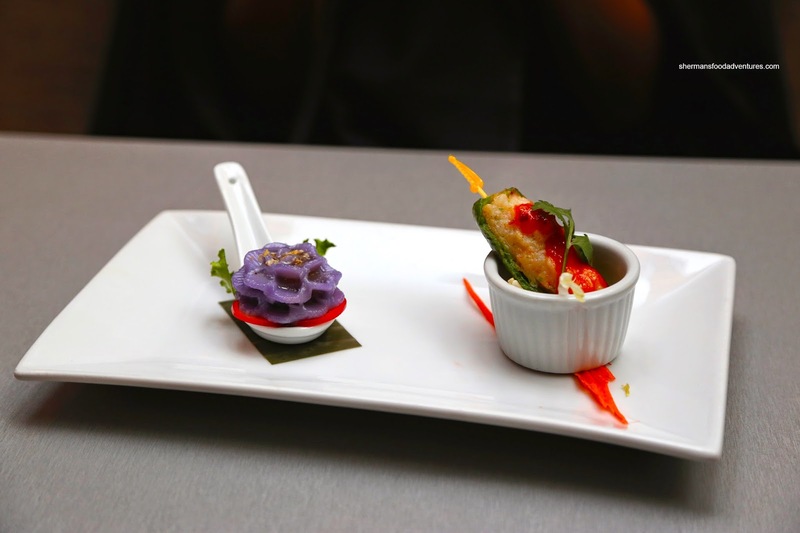 We were started off with a plate consisting of Cho Maung (Steamed homemade flower shaped dumpling stuffed with minced chicken, ground peanuts and Thai spices) and Jalapeno Shrimp (Fresh jumbo jalapeno stuffed with shrimp paste served with house sauce). The flower exhibited a soft and glutinous texture while the filling was sweet and nutty. I didn't mind it, but the filling to "flower" ratio could've been better. The texture of the shrimp mousse was pleasing with a buttery rebound. Combined with the jalapeno and sweet sauce, there was no absence of flavour (and a nice lingering spice). However, we felt it was a bit too sweet. 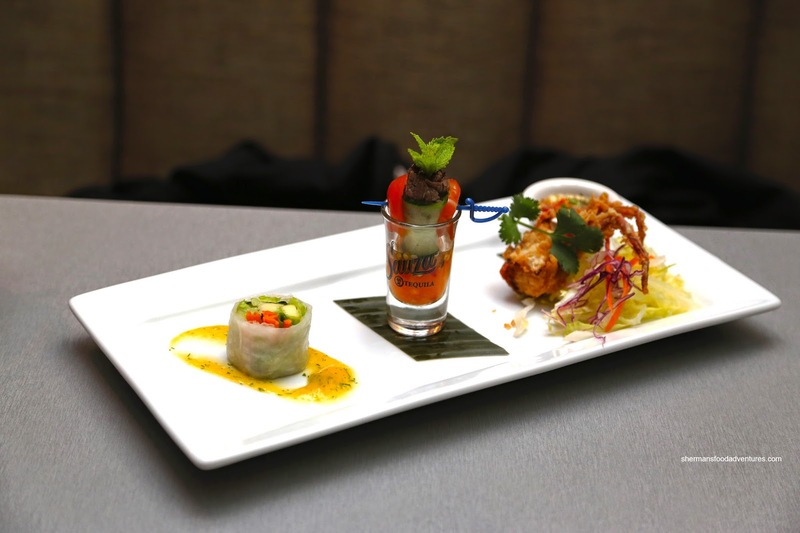 On the next dish, it featured Avocado Roll (avocado, mango, lettuce, onions and fresh basil with homemade mango sauce), Beef Cucumber Roll (BBQ beef rolled with cucumber and tomato with spicy sauce) and Spicy Soft Shell Crab (marinated and breaded with beer and served with spicy apple shallot sauce). We found the avocado roll to be refreshing with a big hit of basil which was accented by the just-sweet-enough sauce. The beef roll was somewhat chewy with a nice crunch from the cucumber. We liked the spicy sweet sauce at the bottom of the shooter glass. As for the crab, it was crispy and light while being easy on the grease. The spicy dip was salty, sweet and not lacking in acidity. 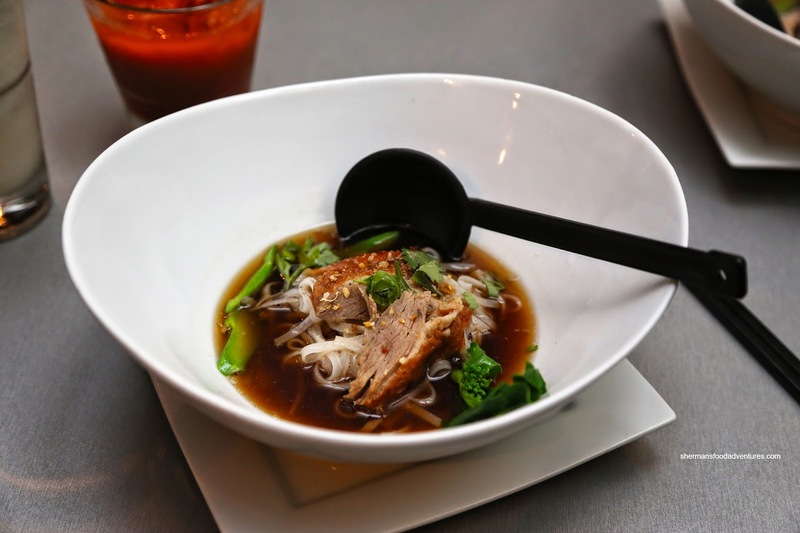 Next up, we had our favourite dish being the Duck Noodle Soup consisting of sliced BBQ duck with rice noodle, bean sprouts and gai lan. With an appealing roasted flavour, the mostly moist duck exhibited plenty of natural flavours. The star of the show was the impactful broth that was sweet and kissed by a touch of soy. There was depth to match the rich meatiness of the duck. Moving onto the Pork Hock with Rice, things got even more sinful as the tender meat was accented by a fatty gelatinous rind. 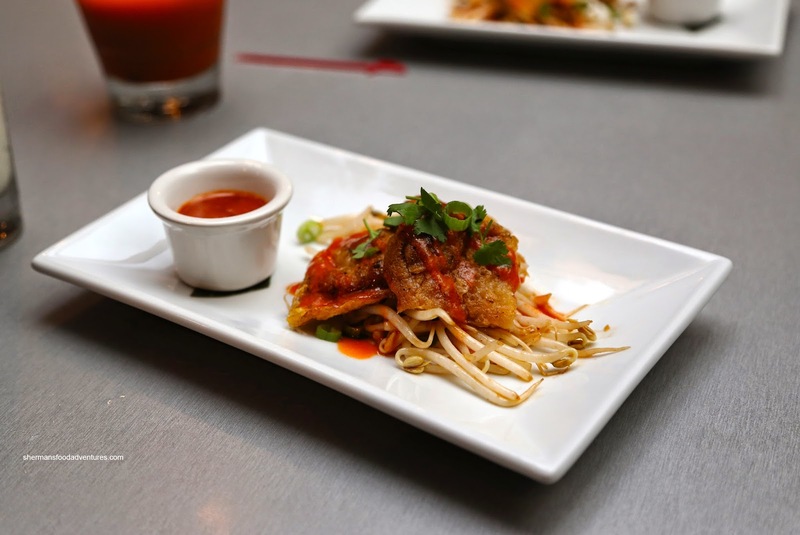 The flavours were mild with a hint of 5-spice, however, things were amped up by the accompanying spicy sauce. Although it is a small detail, we liked how the egg was not overcooked. Continuing with more food, we had the Mussel Omelet with homemade chili sauce. This was really crunchy and resembled a fritter/pancake rather than an omelet. It could've used a bit more moisture as it was dry inside despite the mussels. On the other hand, my next piece was not as dry. We found the sauce to be more akin to sweet chili rather than straight-up spicy chili. 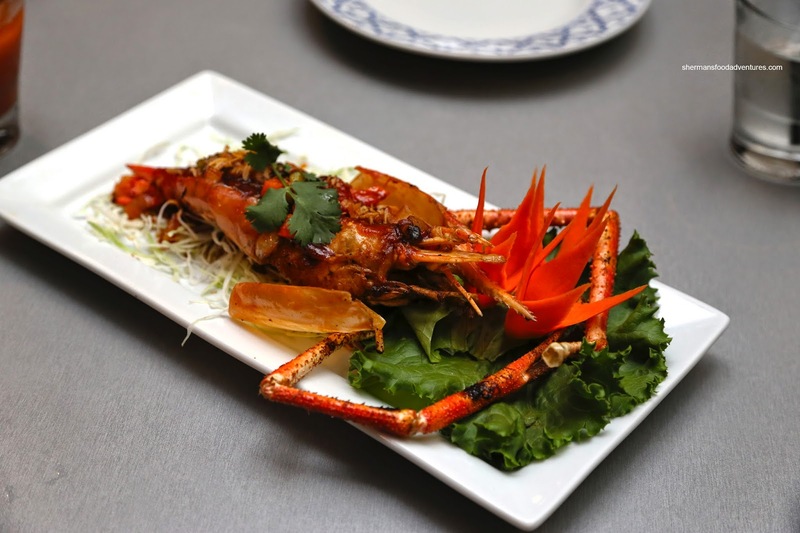 Our last savoury dish was the BBQ Jumbo Prawn topped with tamarind sauce. This was more like a langostino than a prawn in terms of texture and taste. The meat was sweet with minimal spice. There was just enough tamarind for that signature tang without being overwhelming. 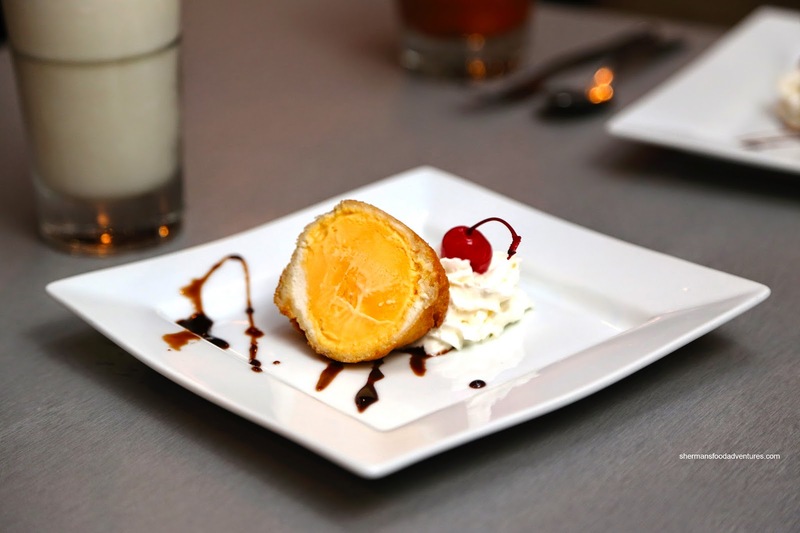 For dessert, we were served Deep Fried Ice Cream which featured a crispy shell encasing hard mango ice cream. With all the interesting food we sampled, this was a bit ordinary. Not that it wasn't any good though as the execution was there as the ice cream stayed hard while the thin batter on the outside was crunchy. 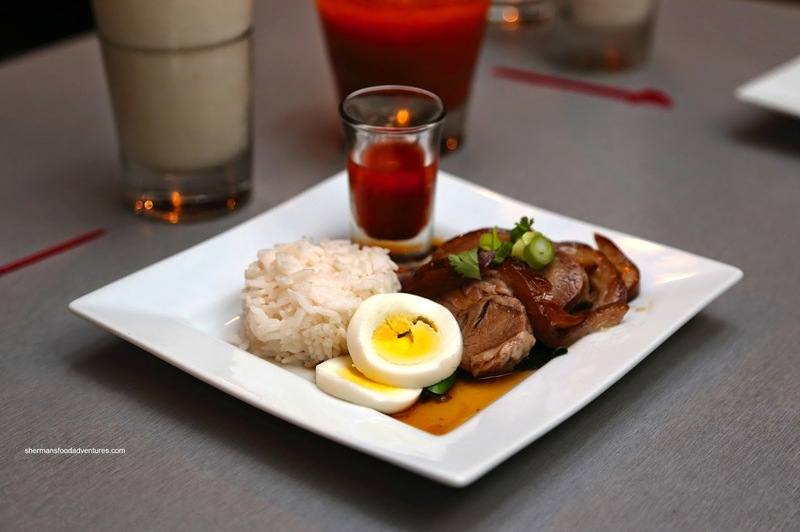 Overall, we were surprised at how enjoyable our meal turned out to be. Definitely something different than what you would find with the existing menu items.